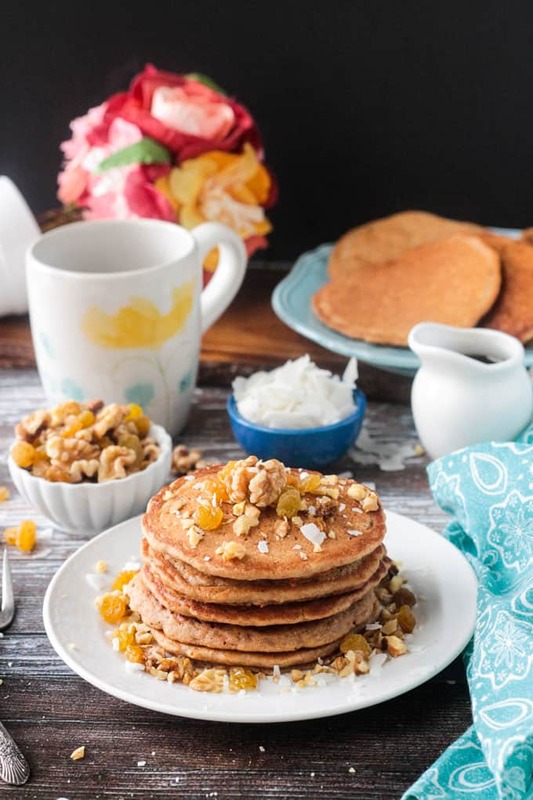 Vegan Carrot Cake Pancakes – A deliciously sweet, veggie packed breakfast even the kids will love! 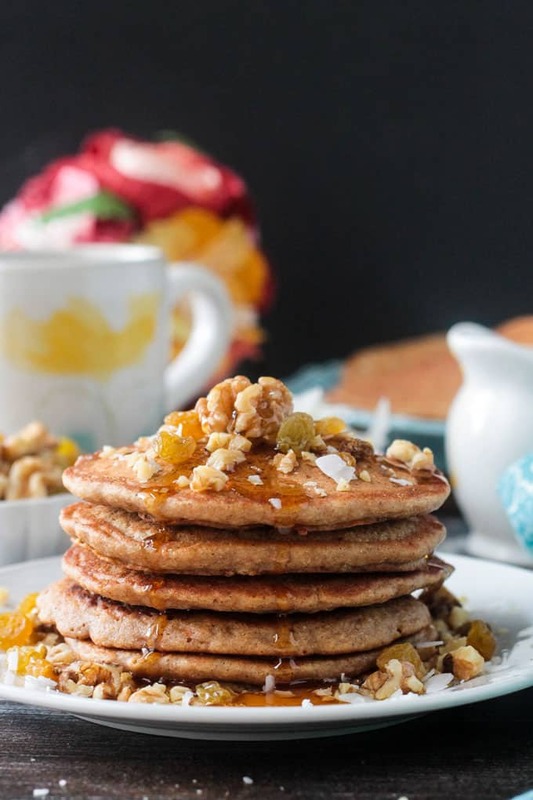 These Carrot Cake Pancakes are loaded with carrots and warming spices for a healthy dose of nutrition and comfort. They are fluffy and moist and I promise your kids won’t mind eating veggies for breakfast if you serve them this way! Perfect for a weekend morning, Easter brunch, or any other time you’re craving pancakes! It’s not often that my kids eat vegetables for breakfast and I’m guessing the same is true in your house. These delicious sweetly spiced pancakes are a perfect way to sneak in those veggies before they even realize what’s happening! Carrots are a very healthy vegetable. Low in calories, high in nutrients, and sweetly crunchy, they make a great snack! They are extremely high in vitamin A. Just one cup contains over 100% of the recommended daily amount. Carrots also contain quite a bit of biotin, vitamin K, fiber, B vitamins, vitamin C, folate, phosphorus, and vitamin E.
This sweet orange veggie has been linked to healthy eyes, good digestion, and a possible decreased risk of cancer. Don’t miss these other carrot recipes! 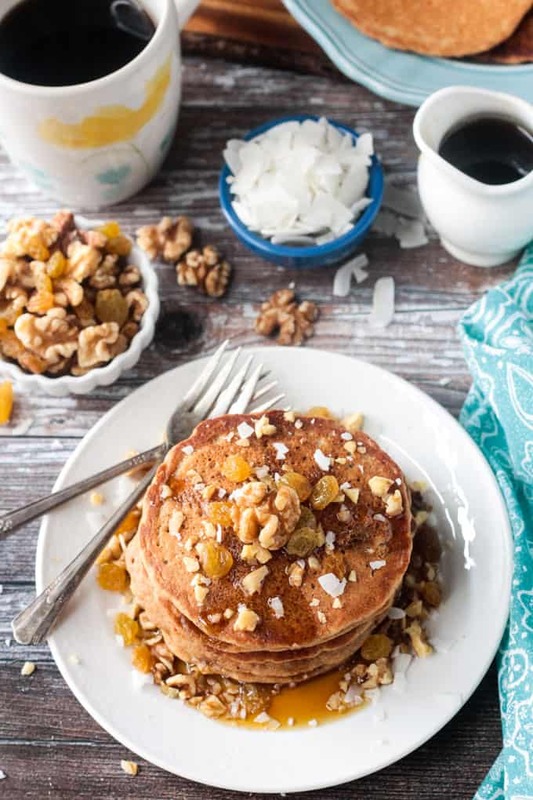 We like to top our pancakes with chopped walnuts, golden raisins, coconut flakes, and a drizzle of pure maple syrup or sweet cashew cream cheese frosting. If you use the Sweet Cashew Cream Cheese Frosting, I would suggest skipping the maple syrup and vice versa. Using both will be way too sweet. Of course, your kids might actually like that, but don’t blame me if they are bouncing off the walls first thing in the morning. 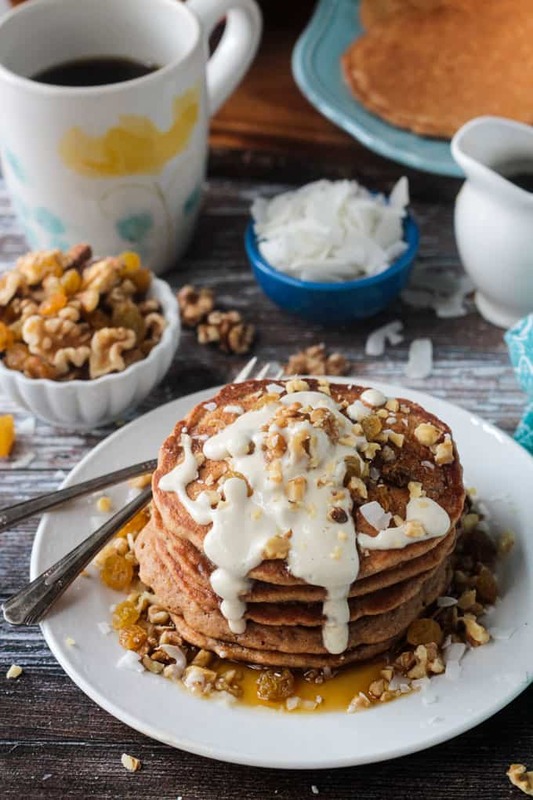 How would you top your Carrot Cake Pancakes? 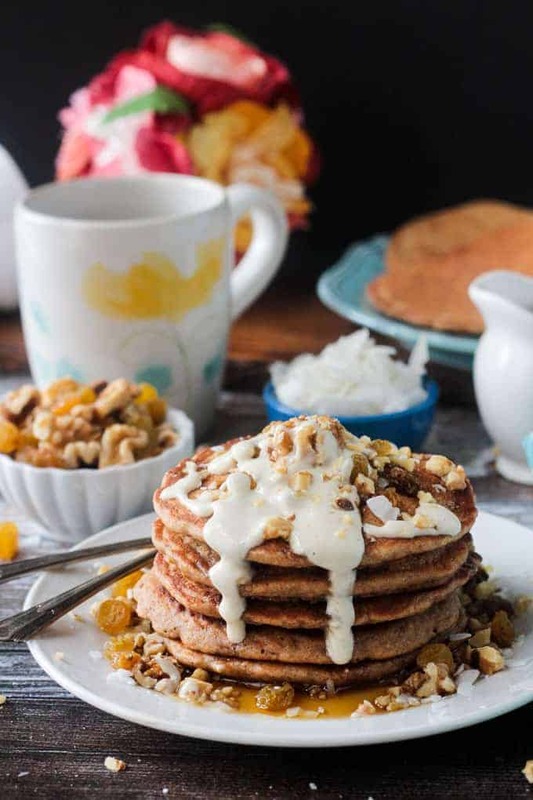 I hope you love these Carrot Cake Pancakes as much as we do. If you try them, please come back and leave me a comment below with your feedback and star rating. A delicious and sweet veggie packed breakfast even the kids will love! In a medium bowl, whisk together the flour, baking powder, cinnamon, nutmeg, and ginger. In a small bowl or large measuring cup, whisk together the coconut milk, coconut water, maple syrup, and vanilla. Stir in the shredded carrots until just combined. Over medium heat, in a non-stick pan (or using a light spray of oil in a regular pan), pour 1/4 cup of the pancake batter into the pan. Cook for 4 to 5 minutes on the first side until small bubbles appear all over the surface and the pancake can easily be flipped. Cook another 2-3 minutes on the second side. Repeat with remaining batter. You may need to adjust the temperature as you go. Place all ingredients in a high speed blender and puree until smooth. Pour into a small bowl and let sit for a few minutes to thicken. 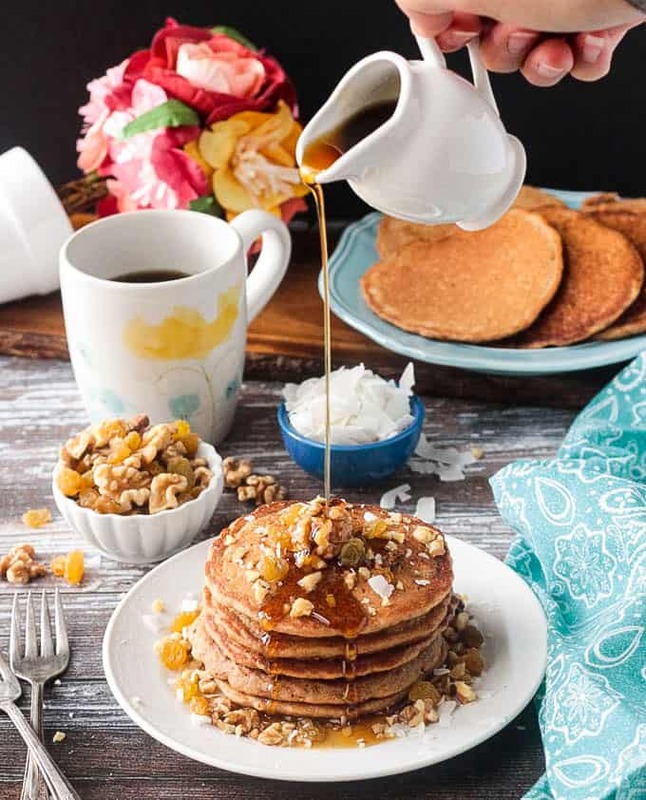 Serve the pancakes garnished with chopped walnuts, shredded coconut, raisins, Sweet Cashew Cream Cheese and/or a drizzle of pure maple syrup. ~Makes about 12 pancakes using 1/4 cup batter per pancake. Nutrition facts calculated figuring two pancakes per person, toppings not included. Recipe, post content, and photos updated April 2019. Original posted April 2015. Photos from the original post. Yikes! Reviewing while I am eating these although I admit it was a difficult choice to set down the fork! SO yummy. Thanks, Jenn! HaHa! I love that!! Thank you, Katie! Did the kids try them? Can you use something less caloric than coconut milk? Yes, any milk should work. Let me know how they turn out! HaHa! I can’t wait to hear what you think, Natalie! I don’t like coconut water. Can I just add extra almond milk? Yes, that should be fine. Enjoy! These look divine! Anybody subbed gluten free flour for the all purpose? Thanks, Terri! I haven’t tried it with gluten free flour, but I’m guessing if you us a gluten free flour blend, it would probably work. Let me know how it turns out if you try it! I use a gluten-free flour (Pilsbury) for every recipe that requires flour (except bread) and all my cakes and cookies and pancakes turn out great. I was going to use it for this recipe as well. Just an FYI. This looks great! Thanks for the recipe. I would think a gluten-free flour blend would work great. Let me know how they turn out! Thanks, Maria! I will check out your blog too! Hi Jenn — This recipe looks so great! I write for ParentMap.com and would love to include this idea in a roundup article of Farmer’s Market Recipes. We would describe the recipe in our own words, and link back/credit your site for the recipe and use one image. Would you be OK with this? Hi, Sharlyn! Thanks for stopping by! Just so I understand correctly, you would not be printing the recipe in it’s entirety? Readers would have to click the link to my site to get the whole recipe? If this is the case, I would be delighted for you to include my recipe. Thank you so much! Yes, that’s correct! No recipe on our side, just a description. Thanks, Jenn! Perfect! Thanks, Sharlyn! Would you send me a link when it’s published so I can promote it as well? LOL, Natalie! Anytime I can feed my sweet tooth in a healthy way, I will! These sound AMAZING. I’m not sure if my family would eat these but I would! Pinned and making these so soon. Thanks for sharing! Jen, if you try it, let me know how your family liked it! My 3 years old girls ate them without any topping at all! Not even maple syrup.